I boarded the uptown C train at 14th Street at around 10:50 on Tuesday morning. You got off at 23rd. You were staring at me. Hard. You're really really really ridiculously good-looking. absolutely intriguing. I guess nothing beats a voluminous moustache! Love the butterfly in the pocket. You could lose yourself in those beautiful eyes! LOVE the checkered shirt...and that's some Moustache! That moustache is so great! I just discovered your blog and it is amazing! I love your imagination. Haha! What a 'stache! I like that he actually is "ridiculously" good-looking. Magnificent. I love the eyes on this one especially. You did it again, Sophie! I adore the checkered shirt (the color combinations are great!). Neat effect having the ends of the moustache trail off and curl into a life of their own! Incredible eyes always do it for me. Stunning! You are brilliant! Love his expression and the wild hairs! I hope she finds him again. Sophie, I adore you, your art and...people's messages...! Your blog is soooo romantic. I love that this illustration is so fanciful. This is absolutely brilliant. I really hope they're going to meet again. Haha. I think there's really a mustache like that in the world. You: Absolutely brilliant illustrator and observer of urban loneliness and interpersonal magic. Me: Was doing some research on a lazy Sunday for work when I accidentally stumbled upon your exquisite blog and am now feeling like a late arrival to a wondrous party. i'm passing along the blogging love by nominating you for a beautiful blogger award. if you accept - - please visit. To the girl in New York who does those heart-rendingly beautiful Missed Connection pics, when I found your blog I fell in love, and I had to tell you. I am moved. And I am enraptured. Hope you don't mind I did a post about you. 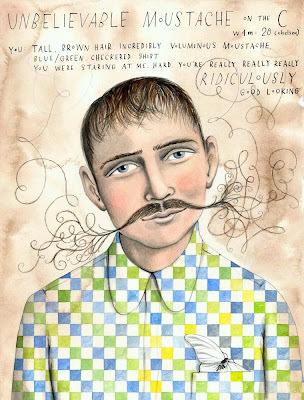 I love your blog, I stumbled upon it this very evening and behold, the most beautiful moustache I ever did see. Wonderful blog! Happy to have found you. I think I should stop shaving. Towards the woman within Ny who individuals heart-rendingly stunning Skipped Link photos, after i discovered your site We dropped within adore, as well as I'd to inform a person. I'm relocated. As well as I'm enraptured.